Amazing custom built bungalow on a beautiful treed lot overlooking parkland. 10 ft ceilings throughout the main level with many of the principal rooms vaulted or cathedral. Open concept floor plan with hardwood flooring throughout. Dream kitchen with custom cabinetry by “Murron”, chef quality appliances, gorgeous granite and backsplash. Located in desirable Morrison, this gorgeous newly built 4.1 bed, 5.2 bath custom smart home by Bachly Construction offers a spacious floor plan boasting 7,353 sq ft of finished living space on a 151ft deep lot. The entrance to this luxury home begins with a dramatic two storey marble foyer, choice finishes with heavy millwork, deep plaster crown moulding, high baseboards, onsite finished hardwood flooring, and halogen pot lighting are used extensively throughout. The 10 ft ceilings, built-in sound system and tasteful light fixtures add an elegant vibrancy. Treehouses appeal to our younger selves, inspiring feelings of warm nostalgia and closeness with nature. Here's a guide to the world's most amazing treehouses! "Absolutely spectacular” best describes this better than new custom built beauty. Over 5,000 square feet of unparalleled luxury abounds within this executive two storey home, plus an additional 3,454 square feet of professionally finished lower level with full, at grade walk-out. Serene private water views from all windows of this corner suite at Oakville’s newest luxury condominium building. Resort living at its finest. This two bedroom, two bathroom condo offers over 1,500 sq.ft. of living space. A separate family room, living room and dining room gives you the feeling of being in a detached home. The large master retreat offers a pocket door, private balcony, walk-in closet and spa like ensuite with separate soaker bathtub and frameless glass shower. Planning a budget friendly and easy kitchen makeover has never been so easy! We’ve compiled 14 excellent ideas on how you can update your kitchen on a tight budget and still end up with a fabulous looking kitchen which looks high end. 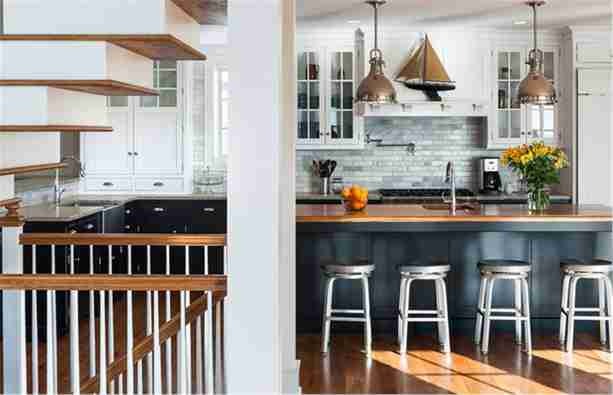 Read on and see what kitchen makeover ideas you can tackle. A gracious lifestyle awaits you in this newly built James Grant custom home. Designed by John Wilmott and inspired by New England Shingle style architecture, this home invites the outdoors in with a wealth of large-scale and architectural windows, taking full advantage of the vistas offered by its picturesque surroundings. Thoughtfully designed landscaping and hardscaping perfect the rustic exterior appeal. The interior is defined by deep, paneled passageways, vaulted ceilings and other charming architectural touches. With all the home buying going on this spring and for summer, we’re sure that some new homeowners and those looking to sell their place are looking for simple ways to achieve a high end look without spending too much. We’ve done our research and came up with 8 money saving ways to achieve a high end look. Good news is, everyone can do these tips even with limited skills and interior design know how. See below to find out more!